Zim. Full credit: Jhonen Vasquez / Nickelodeon / buzzyworld.com / edited kwa me. HD Wallpaper and background images in the Invader Zim club tagged: invader zim invader zim wallpaper desktop. ok ok to make this short I LOVE ZIM!!! BEST SHOW EVER! I LIKE HIM BETTER WITH OUT HIS DISCISE! zim: "get me cleanseing chalk, now gir now!" gir: "i made it myself!!" 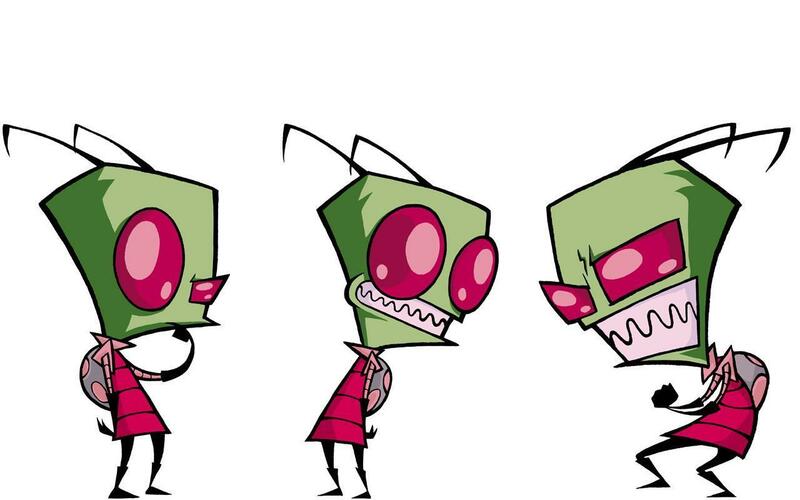 Oh my god,I just love the picture especially the ones with Zim in it.Dib he is a jerk,I can`t believe he wants to kill Zim,that should be against the law,well it is on the irken planet.I am just so upset they canceled his show,WHO GIVES A DAMN ABOUT LOW RATINGS AND BLOODY G.I.R WHO GIVES A DAMN.But Zim will live on in our hearts forever,except for those Dib lovers!I`ll miss you Zim and I always will! Ok,even I know that`s wrong probably other Invader Zim fangirls would agree with me because we would let Zim take over our planet,if they don`t well,f*** them! Eyebrowless eye raise makes me fall. So hot!